Well Sydney's weather has gone from ridiculously hot yesterday to cool and windy today - it seems the weather has finally realised it's Autumn. Oh how I love Winnie the Pooh! 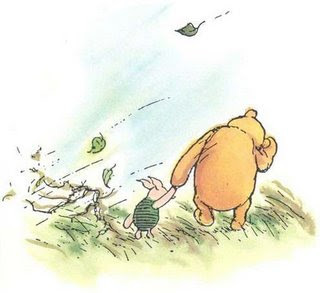 Whilst walking around the park in my pink sweatshirt this morning, I felt a bit like Piglet in Winnie the Pooh and the Blustery Day as leaves were whipping into the hair and the wind was pushing me back. I don't know about you, but cold and windy days make me crave warm comforting food. 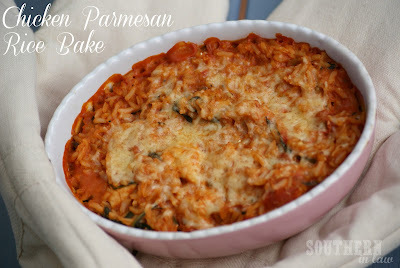 For some reason baked meals always seem warmer than something you cook on the stove (does anyone else think this way?). So, to suit this blustery day, I thought I'd share one of our favourite quick and easy, warm and comforting dinners at the Southern In-Law household. This dish goes to show that comfort food doesn't have to mean calorific! 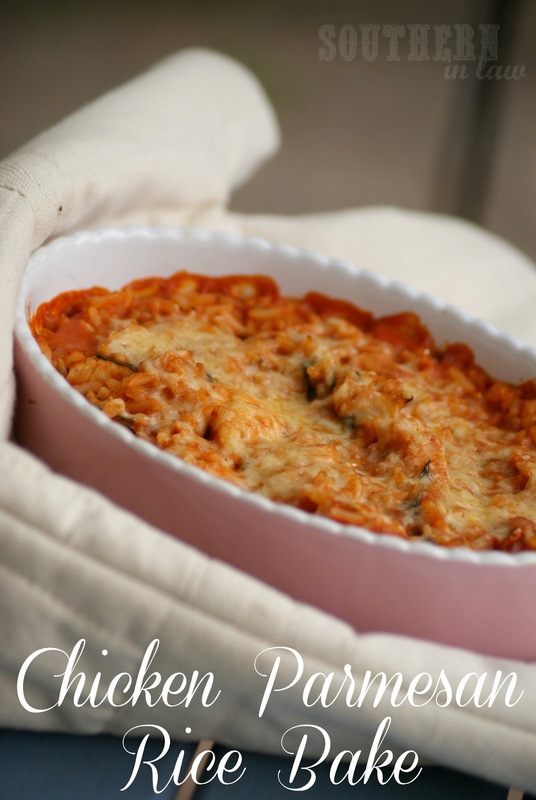 This Chicken Parmesan Rice Bake is low in fat, gluten free and so simple to make - especially if you're using leftover cooked rice. This recipe makes a single serving - however, it is so simple to multiply. I make it for just Jesse some nights and other nights I'll serve it to a crowd - all you have to do is multiply the amounts! Preheat your oven to 200°C/390°F. Prepare a small casserole dish or ramekin by lightly spraying it with oil, lightly greasing it with butter/margarine or lining it with baking paper. In a medium non-stick saucepan lightly sprayed with oil, saute the chicken with the garlic. Once the chicken has cooked, add in your tomatoes, cream cheese, seasonings and spinach, stirring until the cream cheese has melted through and the spinach has wilted. Add in the cooked rice, stirring to combine. Pour your rice mixture into the prepared dish, topping with parmesan cheese. Place into the oven, cooking until the cheese has melted and starts to lightly brown. *When we're in a hurry, I use Brown Rice Quick Cups from Sunrice and I also freeze single portions of cooked brown rice whenever I get the chance for quick and easy dishes like this. So tell me, what are your favourite cold weather meals? Cream could certainly work - or the philadelphia cream for cooking. We always use cream cheese so it's always in the fridge, hence why it's in this recipe. You can't taste the cream cheese, it just takes the edge off the acidity of the tomatoes and makes it slightly creamy. Give it a try with cream (I'm going to say it will work as so many tomato dishes call for cream) or you could easily leave it out as well - it won't make too much of a difference. We often use plain chobani in dishes like this as well (though usually where a dish calls for sour cream as you can taste it slightly). Well, as I understand it, Piglet's favourite food is acorns (or as the book often spells it, "haycorns"). But I feel certain he'd rate this as his second most favourite food. Chicken Noodle Soup is on my to-make list as Jesse keeps asking me if I'll make some - so I need to get onto that! Hey Erica, definitely do! Jesse says it's even better than a chicken parmigiana because "of all the carbs" haha!